Midnight showings of The Rocky Horror Picture Show first began in Austin, Texas at the Riverside Twin Theatre in mid-May of 1976. Riverside was the second theatre, after the Waverly in New York City, to begin midnight showings of RHPS. Austin is a college town and the area around the Riverside was a huge warren of largely student-occupied apartment complexes, a built-in audience. Rocky Horror caught on immediately in this eccentric, tolerant town, and soon attracted sell-out crowds, with many people dressing up and returning repeatedly. Every weekend since opening at the Riverside there has been at least one midnight screening of Rocky Horror in Austin, making Austin the home of the longest continuously running Rocky Horror IN THE WORLD! Rocky continued its successful run, at some points on more than one screen, at the Riverside Twin into the early 80s. At this point, a cast based in San Antonio known as "The Roxy Cast" began road-tripping to Austin to play every month and sometimes every two weeks. Austin regulars began performing in their show, and then formed their own resident cast, "Creatures of the Night". Rocky Horror began showing at its current home in Austin, the Northcross Six Theatre, on September 23rd, 1983. It still plays there today, more than thirteen years later. In that time, our cast has been known by several different names including: "Little Cast of Horrors", "River City Rocky", "Northcross Dressers" and simply "Austin Rocky Horror". The current incarnation of our cast, "Lip Service", was born out of the dark days following the 19th Anniversary of Austin Rocky Horror in May '95. Many people had left and the cast was gradually falling apart, culminating on elections night in June when not one single person wanted to run for Triumverate. We had to beg three people to run, so that Austin Rocky Horror could at least continue in some form. Two of the three people that had been guilt-tripped into being on Triumverate soon quit, and the cast continued to fall apart until an emergency cast meeting was called on July 1st. At that time an entirely new system of government (known as "Roctopussy") was created to replace the ailing Triumverate system, which had been in place for the past nine years (since late '86). Elections were held and we began to finally pull back together. Keep in mind though that even while the cast was falling apart, we still had people performing each night. 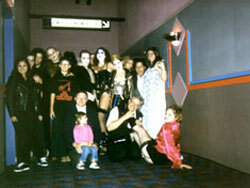 We have had a cast performing at every single showing of Rocky Horror in Austin since early '89. In September '95, it was decided that our new cast should also have a new name. The cast name was then changed from "Northcross Dressers" to its current name, "Lip Service". In the past year, Lip Service has met with much success. We have performed to sell-out crowds for shows at both the 20th and 21st Anniversaries of RHPS and at the 20th Anniversary of Austin Rocky Horror. We have had three enjoyable cast-swaps with the After Midnight Cast of Houston's River Oaks Theatre. We have also put on several different theme shows, including: Gender Bender, Lingerie Night, Unisex Weekend, Rookie Weekend, and Schizo Night. Our local Fox TV affiliate has twice broadcast cast interviews and footage from before the show. We have also performed as part of cast member James Laljer's "Old Bitty Show" on ACTV two different times. And finally we were recently honored by The Austin Chronicle, which voted us "Best Long-Running Late Night of 1996" in the Critics' Poll of its annual Best of Austin feature. A long-term cast member, Joanna Stephens, recently attended her 1300th theatre viewing of RHPS a bit over a month ago on Friday, September 27th. In an interesting twist of fate, this happened to coincide with the weekend we celebrated the 21st Anniversary of the U.S. Premiere of The Rocky Horror Picture Show. Joanna first attended RHPS at the National Twin Theatre in Corpus Christi, Texas on March 13th, 1977. Her close to twenty year love affair with Rocky Horror went on from there after the Movies Two started showing Rocky on a regular basis in November 1978. She moved to Austin in 1984 and met her husband, James Laljer, in early 1986 at Rocky Horror in Northcross. In true Rocky Horror style, they were married in front of the movie screen at the Riverside Dollar Cinema (a reincarnated Riverside Twin) after Rocky Horror. They will be celebrating their 10th Anniversary this month on November 11th. Lip Service performs every Friday and Saturday at midnight at the Northcross Six Theatre in Northcross Mall, at the intersection of Anderson Lane and Burnet Road. We have a brand new Superheroes print of the film as well as a copy of the original Rocky Horror trailer.